I have had this poor fig in a small pot for years. I could never figure out where to put it. Today, in the blistering heat, I was roaming around looking for a stretch of fence that I could let it ramble across like a friends fig tree. Did I mention it was hot! So the greenhouse, now beautifully sitting in the sun, reached well over 40 degrees today with two fans running and misting to cool it. The light went on...people espalier their figs, so I could prune it to go flat against the greenhouse and cool the greenhouse with its nice big leaves all summer and then fall off and let the sun through in the winter. 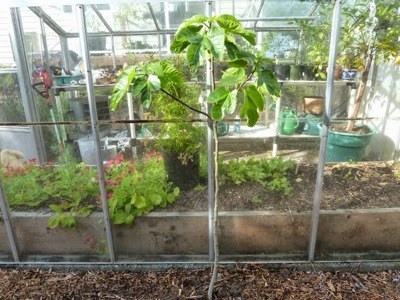 Erin, don't forget that a Fig-tree benefits from having its roots constrained. If left to grow unrestricted, it puts all its energy into foliage and not into fruit. I suggest you put it in a large container sunk below ground level.